The things I put myself through in the name of art! 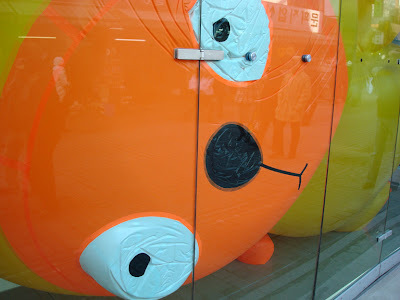 This poor bear is stuffed in the front window of Gallery Artside in Insadong. It's part of the 2nd Dream of Winter exhibit running from December 12th through the 28th. If you happen to be near the Insadong area, it's worth a short visit. The exhibit is small. It consists of pieces inspired by the dreams of childhood. My guess is if you like cartoons that you'll like this exhibit. It's sweet, simple, and free. standing here. What dreams do you have now? If you go to this exhibit and find my recommendation was a sour one, I do not apologize for this. Why? Because next door to this exhibit is a small permanent robot museum and across the street is a nostalgia shop full of cartoon characters. Just check those out. Insadong is also full of other galleries, although they aren't as animated as this one. I would definitely check out the robot museum! What happened to the bear? Why is it so huge and stuffed there in the front window? I guess it catches people's attention, but it seems so strange. Trojan Trumpet, Gallery Artside always does interesting stuff to get your attention. If I'm not mistaken, they do some performance art stuff outside the gallery sometimes, too. Nug' Knight, I'll make sure and post more about that robot gallery in the future. maybe do you forget moving apartment? ^^ see you soon..
Glad I could help. 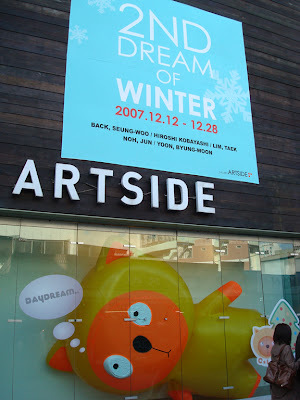 But keep in mind, this Gallery Artside is in Seoul, KOREA, not Beijing! I hope you didn't get them mixed up!! !